Growing up on a dairy farm in the Ohio River town of Derby, Joann Etienne saw her parents put all of their resources back into the family business Disposable income was non-existent. If someone needed new clothes, a trip to the store meant picking out patterns and materials and returning home to the Singer sewing machine. It wasn't until Joann entered high school and was told by "city kids" that she was poor that she ever thought of her lifestyle in that regard. "I hate money," Joann says without hesitation, "but they do keep score with it. If you want to have money, don't go into the forestry products business. You have to love it." Is it an easy business? No. Are the hours long? Yes. Is there a down time when the pace slows to a manageable level? Not really. But the Etiennes know no other way of life. Three of their four children, along with spouses and other relatives, are alongside their parents in important roles. Several husband-wife teams and other family relationships can be found among the 70 employees. "I think the family thing makes our team stronger," Joann relates. "The key is to hire people smarter than you are and go to work for them. They run the company. I just coordinate their efforts. She receives strong assistance from daughter Cindy Emmons, who vowed at one time that "I was not going to work at this place" after growing up riding in the log trucks, cleaning in the sawmill and doing most every other job one could imagine. 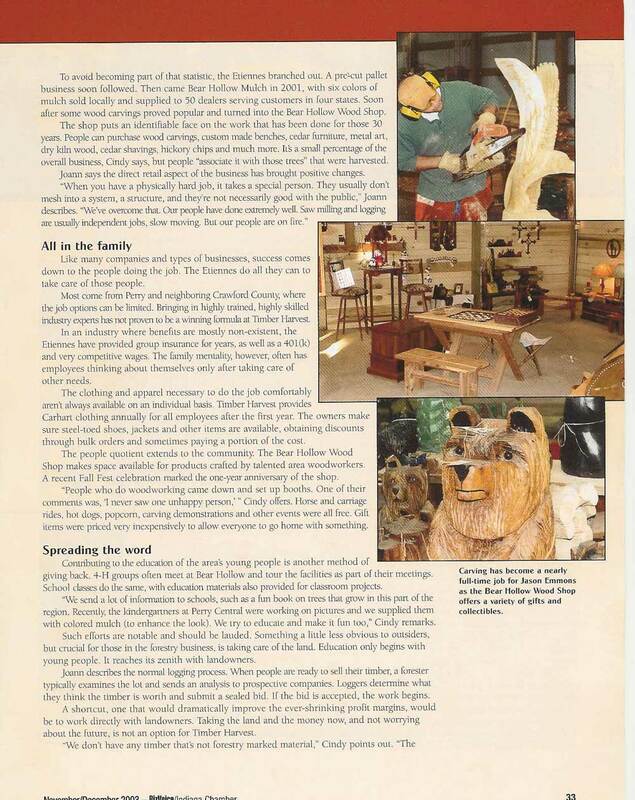 Cindy went to college and met her husband Jason (now the head carver for the Bear Hollow Wood Shop) and soon returned home. "I thought I wanted a job where you leave home in the daylight and come home in the daylight," she explains. "I lasted one year at college (completing her degree later through night courses) and found that what I through I didn't want to do was what I really wanted." Phil and Joann started Etienne's Logging in 1973. 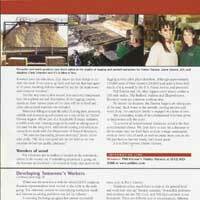 The Timber Harvest name and the saw milling portion of the business came 10 years later. The cnages in the last four years have been substantial. At a 1999 industry conference, the common story was that survival was going to be difficult without diversification, without value-added products in addition to just taking logs and selling the green lumber. Profit margins have all but disappeared. "You can't do business like you did 10 years ago or five years ago," Joann contends. "The industry had overproduced for years. We've lost a third of that industry." To avoid becoming part of that statistic, the Etienne's branched out. A pre-cut pallet business soon followed. Then came Bear Hollow mulch in 2001, with six colors of mulch sold locally and shipped to 50 dealers serving customers in four states. 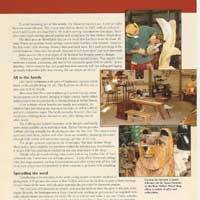 Soon after some wood carvings proved popular and turned into the Bear Hollow Wood Shop. The shop puts an identifiable face on the work that has been done for those 30 years. People can purchase wood carvings, custom made benches, cedar furniture, metal art, dry kiln wood, cedar shavings, hickory chips and much more. It's a small percentage of the overall business, Cindy says but people "associate it with those trees: that are harvested. Joann says the direct retail aspect of the business has brought positive changes. "When you have a physically hard job, it takes a special person. They usually don't mesh into a system, a structure, and they're not necessarily good with the public," Joann describes. "We've overcome that. Our people have done extremely well. Saw milling and logging are usually independent jobs, slow moving. But our people are on fire." Like many companies and types of businesses, success comes down to the people doing the job. The Etiennes do all they can to take care of those people. Most come from Perry and neighboring Crawford County, where the job options can be limited. 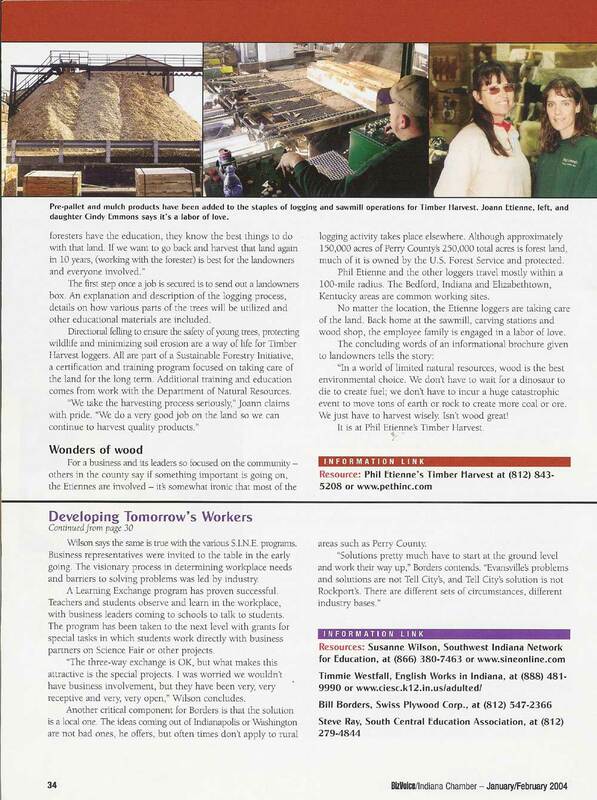 Bringing in highly trained, highly skilled industry experts has not proven to be a winning formula at Timber Harvest. In an industry where benefits are mostly non-existent, the Etiennes have provided group insurance for years, as well as 401(k) and very competitive wages. The family mentality, however, often has employees thinking about themselves only after taking care of their needs. The clothing and apperal necessary to do the job comfortably aren't always available on an individual basis. Timber Harvest provides Carhart clothing annually for all employees after their first year. The owners make sure steel-toed shoes, jackets and other items are available, obtaining discounts through bulk orders and sometimes paying a portion of the cost. The people quotient extends to the community. The Bear Hollow Wood Shop makes space available for products crafted by talented area woodworkers. A recent Fall Fest celebration marked the one-year anniversary of the shop. "People who do woodworking came down and set up booths. One of their comments was, 'I never saw one unhappy person,' "Cindy offers. Horse and carriage rides, hot dogs, popcorn, carving demonstrations, and other events were all free. Gift items were priced very inexpensively to allow everyone to go home with something. Contributing to the education of the area's young people is another method of giving back. 4-H groups often meet at Bear Hollow and tour the facilities as part of their meetings. School classes do the same, with education materials also provided for classroom projects. "We send a lot of information to schools, such as fun books on trees that grow in this part of the region. Recently, the kindergartners at Perry Central were working on pictures and we supplied them with colored mulch (to enhance the look). We try to educated and make it fun too," Cindy remarks. Such efforts are notable and should be lauded. Something a little less obvious to outsiders, but crucial for those in the foresty business, is taking care of the land. Education only begins with young people. It reaches its zenigh with landowners. Joann describes the normal logging process. When people are ready to sell their timber, a forester typically examines the lot and sends an analysis to prospective companies. Loggers determine what they think the timber is worth and submit a sealed bid. If the bid is accepted, the work begins. A shortcut, one that would dramatically improve the ever-shrinking profit margins, would be to work directly with landowners. Taking the land and the money now, and not worrying about the future, is not an option for Timber Harvest. "We don't have any timber that's not forestry marked material," Cindy points out. "The foresters have the education, they know the best things to do with that land. If we want to go back and harvest that land again in 10 years, (working with the forester) is best for the landowners and everyone involved." 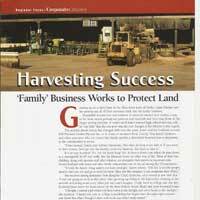 The first step once a job is secured is to send out a landowners box. An explanation and description of the logging process, details on how various parts of the trees will be utilized and other educational materials are included. Directional felling to ensure the safety of young trees, protecting the wildlife and minimizing soil erosion are a way of life for Timber Harvest loggers. All are part of a Sustainable Forestry Initiative, a certification and training program focused on taking care of the land for the long term. Additional training and education comes from the Department of Natural Resources. 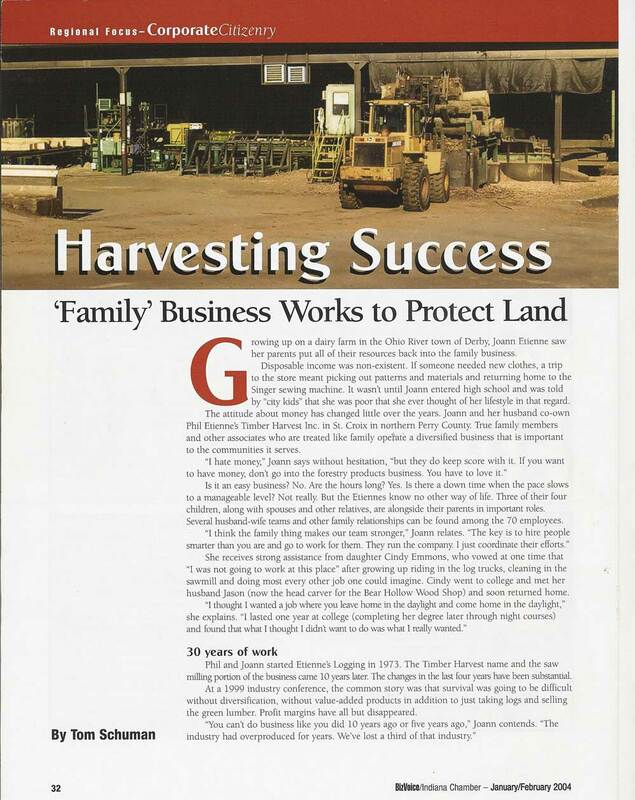 "We take the harvesting process seriously," Joann claims with pride. "We don a very good job on the land so we can continue to harvest quality products." For a business and its leaders so focused on the community - others in the county say if something important is going on, the Etiennes are involved - it's something ironic that most of the logging activity takes place elsewhere. Although approximately 150,000 acres of Perry County's 250,000 total acres of forest land, much of it is owned by the US Forest Service and protected. Phil Etienne and the other loggers travel mostly within a 100-mile radius. The Bedford, Indiana and Elizabethtown, Kentucky areas are common working sites. No matter the location, the Etienne loggers are taking care of the land. Back home at the sawmill, carving stations and wood shop, the employee family is engaged in a labor of love. The concluding words of an informational brochure given to landowners tells the story: "In a world of limited natural resources, wood is the best environmental choice. We don't have to wait for a dinosaur to die to create fuel; we don't have to incur a huge catastrophic event to move tons of earth or rock to create more coal or ore. We just have to harvest wisely. 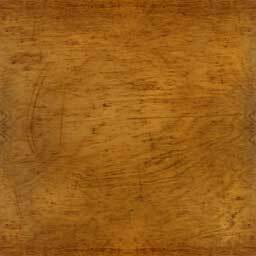 Isn't wood great!" It is at Phil Etienne's Timber Harvest.